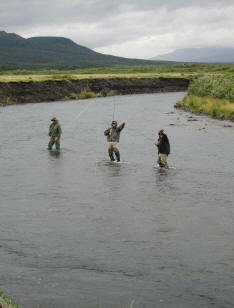 Pumice Creek Lodge on the Alaska Peninsula opens in June as "the kings" start their run up stream. We fish for these twenty to forty pound monsters very near salt water so you can be assured to catch strong, dime-bright fish. When the kings are running, there are also many reds and some rainbows up to ten pounds. These rainbows are catch and release only so have your camera ready. As the season progresses and the salmon start spawning, the Arctic char move in for the salmon eggs. The action on the fly pole is nonstop with these two to eight pound fighters. This fishing is primarily from the riverbank with your transportation by aircraft and boat. In the evening, you return to the lodge for a meal of the day's catch or possibly a choice grilled New York steak. After dinner you can enjoy a walk around camp - or if golf is your game you can use our landing area as a driving range. 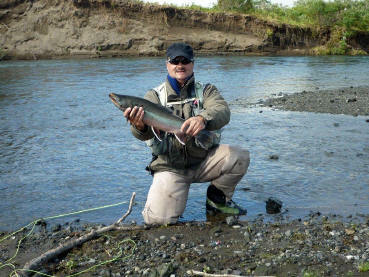 If silver salmon is your goal, I offer August fishing for this ferocious fighter. These tough fish will hit fly or spinner at will. They pack into the lower stream mouths and offer fantastic nonstop excitement. Fishing times are mid August into October. Visit our fishing Gallery page to see all our guests great catches.